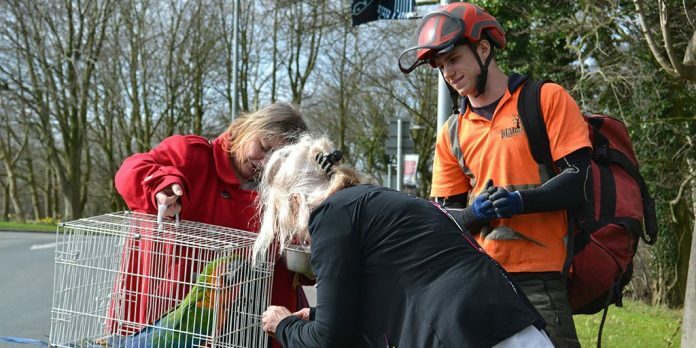 A parrot has been rescued from a tree on Lancaster University campus. The Lancaster Guardian reported on Twitter that a “distressed parrot” was stuck in a tree at 11.29 on Tuesday morning, opposite the media relations building. At 13.03 the official Lancaster University Twitter account posted that the parrot had been rescued – “thanks to our courageous tree surgeon, Michelle & Jayne.” The Lancaster Guardian suggested that food had been used to lure the parrot down. Tim Wardle, from Security, spoke to SCAN about the ordeal. He said that he noticed the Macaw stuck in the trees and tried to lure it down with some food. He said a passing tree surgeon climbed the tree to help catch the bird. Michelle Greenwood, of A1 Parrot Rescue, took the bird home and said she will attempt to find its owner. Bob Jones, of the Cumbria Bird Club, identified the bird as a Macaw: “definitely an escaped pet – and possibly of some value” – he explained. The fact it was captured and caged demonstrates that it is clearly used to being handled, he said.